The Global Volcanism Program has no activity reports for Berlin. The Global Volcanism Program has no Weekly Reports available for Berlin. The Global Volcanism Program has no Bulletin Reports available for Berlin. Mount Berlin consists of two coalescing shield volcanoes, Berlin Crater and Merrem Peak, each with a 2-km-wide summit caldera. Mount Berlin is located in the Flood Range of Marie Byrd Land, near the eastern coast of the Ross Sea. The two calderas are oriented along an east-west line, characteristic of Flood Range volcanoes. The westernmost and highest volcano, Berlin Crater, reaches 3478 m and is located 3.5 km ESE of Merrem Peak caldera. Berlin Crater displays active fumaroles along its western and northern caldera rims, producing the characteristic Antarctic fumarolic ice towers. The youngest dated tephra of a series of tephra layers in glacial ice at Mount Moulton that was attributed to Mount Berlin had an age of about 14.5 +/- 3.8 thousand years (ka), and a younger undated tephra layer was present. A lava flow at the base of an ice cave below a fumarolic ice tower was dated at about 10.3 +/- 2.7 ka. Wilch T I, McIntosh W C, Dunbar N W, 1999. Late Quaternary volcanic activity in Marie Byrd Land: potential 40Ar/39Ar-dated time horizons in West Antarctic ice and marine cores. Geol Soc Amer Bull, 111: 1563-1580. There is no Deformation History data available for Berlin. There is no Emissions History data available for Berlin. 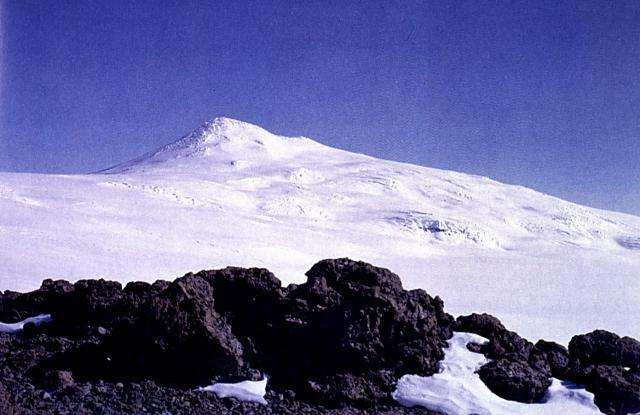 Mount Berlin, seen here from Mount Moulton to the east, is located in the Flood Range of Marie Byrd Land, near the eastern coast of the Ross Sea. Mount Berlin consists of two coalescing shield volcanoes, Berlin Crater and Merrem Peak, each with a 2-km-wide summit caldera. The two calderas are oriented along an E-W-trending line, characteristic of Flood Range volcanoes. Berlin Crater displays active fumaroles along its western and northern caldera rims, producing the characteristic Antarctic fumarolic ice towers. The Global Volcanism Program has no maps available for Berlin. There are no samples for Berlin in the Smithsonian's NMNH Department of Mineral Sciences Rock and Ore collection. Large Eruptions of Berlin Information about large Quaternary eruptions (VEI >= 4) is cataloged in the Large Magnitude Explosive Volcanic Eruptions (LaMEVE) database of the Volcano Global Risk Identification and Analysis Project (VOGRIPA).